BELGRADE – Formation of the joint commission between government and opposition for defining fair electoral conditions, election of new Regulatory Body for Electronic Media members, together with a new management of Radio-Television od Serbia, country’s public broadcaster – these are the three demands requested by the Serbian opposition parties during the protest on Saturday, 13 April, with a deadline of six days. This was the first time after more than four months of demonstrations that citizens from all parts of Serbia have joint forces in Belgrade. According to the estimations of opposition and organization “1 of the five million”, they managed to stage one of the most attended anti-government protests since the current ruling parties came to power in 2012. The number of attendants remains hotly disputed, though. 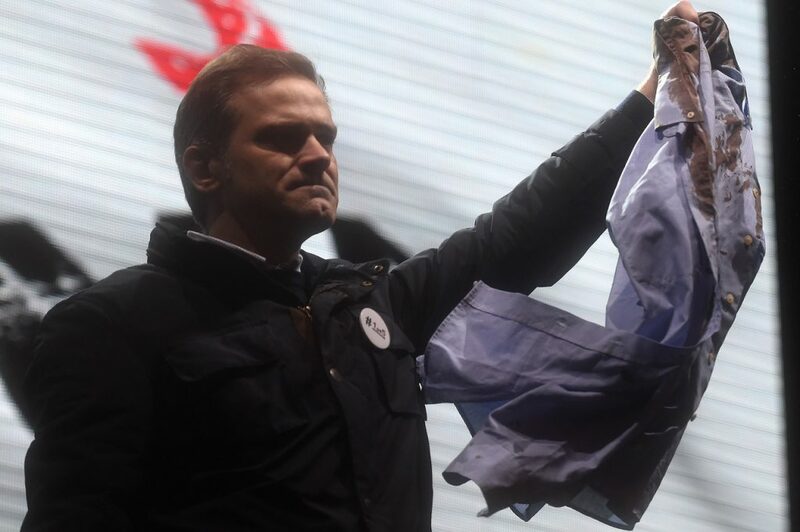 While the opposition politician Zoran Živković claimed there was 35.000 people, Minister of Interior Nebojša Stefanović stated that there was little more than 7.000 – this is nevertheless his highest estimate of the number of protesters since the demonstrations began last December. However, the government has been accused for preventing an even larger number of people from coming to the capital. “Many were unable to come… Regular bus rides have been canceled”, said the announcer Jugoslav Kaprijanović during the event, referring to the multiple allegations of pressure exerted on private transport companies that had been surfacing on the social networks (YouTube channel 1od5 miliona). According to N1 television, regular bus rides to Belgrade from Pančevo, a city 20 km east from the capital, were canceled on Saturday “due to the lack of fuel and personal”. Taxis were also prevented from offering rides to the city because of extraordinary inspections. Police in Pančevo denied all allegations of pressure, while Minister Stefanović stated that everybody (in Serbia) that wanted to come, had an opportunity and means to come. 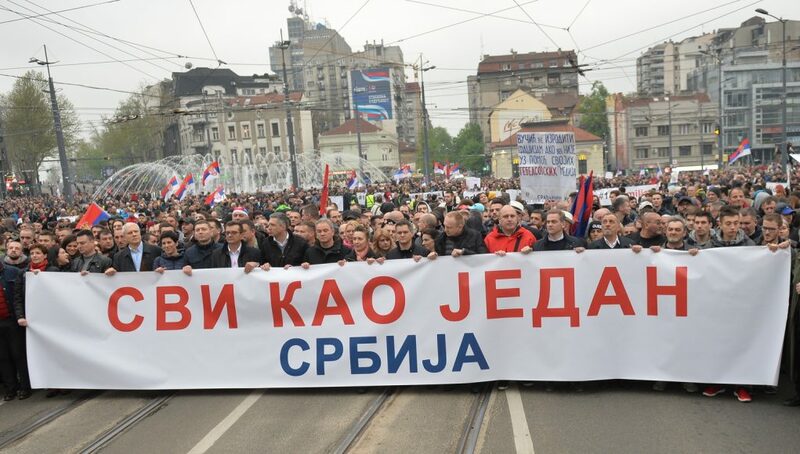 “President Vučić wanted to address the protesters, but he changed his mind due to a low number of people”, also stated Stefanović, adding that the messages and speeches at the protest were laughable. On the other hand, the speakers did not find the motives of the protests amusing at all – they mostly criticized what they describe as an authoritarian style of President Vučić’s rule. “The Constitution of Serbia recognizes the legislative, executive and judicial power, which are exercised by the National Assembly, the Government and courts. Because of his power, Vučić participates in exercising all three of them”, said one of the speakers and ex-Supreme Court judge Zoran Ivošević. 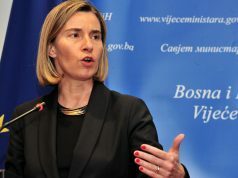 The organisers also demanded from Vučić to reveal his plan for the resolution of the issue of Kosovo to the citizens in the lead-up to the meeting with the officials from Pristina in Berlin on 29 April. Other reactions of the ruling parties consisted of retreating to the local assemblies across Serbia (all but three of which are controlled by Serbian Progressive Party and its allies), so that they could be defended from the opposition’s alleged violence. This was a reference to the attempt of several opposition leaders to enter the Assembly of Belgrade two weeks ago, in order to register a complaint about the city’s restructuring to the mayor Zoran Radojičić. They were prevented in the attempt by the local ruling party MPs, who blocked their way at the entrance. No acts of violence have been reported. National Assembly of Serbia, in front of which the first part of the protest was held, was similarly treated. Government MPs, who jointly hold more than 160 out of 250 seats, decided to defend the building, which was famously stormed during the fall of Slobodan Milošević’s regime in 2000. It was also packed with police even though there had been no official request for protection, tweeted opposition MP Balša Božović. These steps turned out to be the pinnacle of government’s reaction, even though Minister of Defense Aleksandar Vulin also announced a hunger strike against the opposition’s violence, which he later postponed. The next stage of this political struggle is therefore expected on Friday, the day of government’s counter-demonstrations in Belgrade, as well as the deadline for opposition’s new demands. 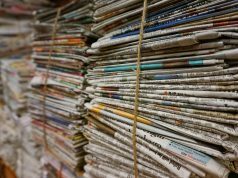 Next articleWhat is the role of civil society in the Western Balkans?